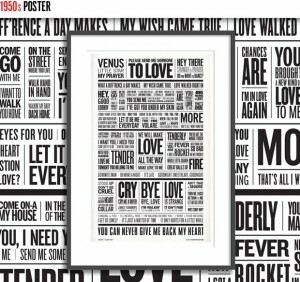 A suite of silk screened posters from TypographyShop that tell a love story entirely in song titles from the 1950s (left), 60s, 70s and 80s. 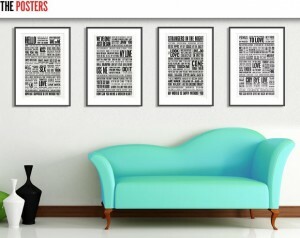 Each of the four posters tells a love story, from hopeful beginning through falling in love, expressing its passion, the appearance of trouble and doubt, the inevitable breakup and its lonely aftermath. Told entirely via song titles from each decade. These aren’t just a random selection of titles, each one was carefully chosen for its ability to further the narrative in an evocative and often humorous fashion. Hundreds of hours went into designing each of these posters. Researching the charts from each decade, reviewing lyrics to ensure the song’s title reflected its story, laying out the typographic patchwork and carefully kerning every word. The posters are silk screened in black ink on whit e 110 lb. recycled, acid-free French Paper by Kayrock Screenprinting in Greenpoint, Brooklyn. They measure 15.5X24 inches and are unframed. They will be shipped in sturdy, protective mailing tubes. Shipping costs will be added to your pledge amount. Backers will be able to indicate their choice of posters via the survey upon completion of the campaign. 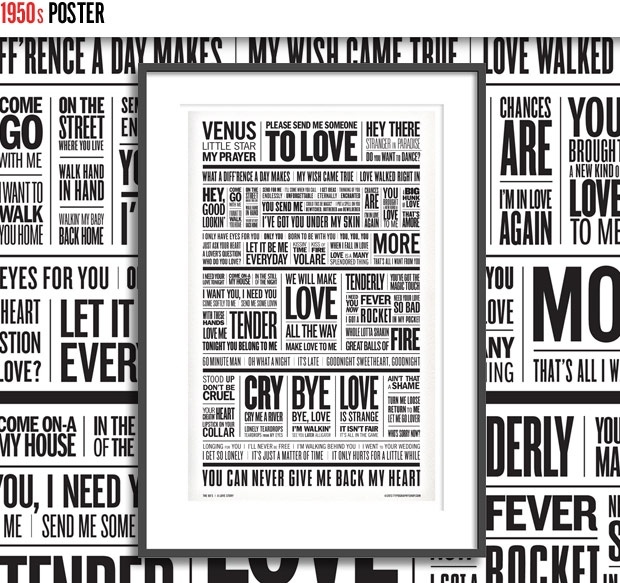 Whether you’re a music lover or just a lover of love, these will look great on the walls of your home or office. Also find the playlist on YouTube for each decade so that you can listen to all the featured songs in the order they appear in the posters. Click to hear the 1950s, 1960s, 1970s and 1980s posters in medley form.